We liked the location of the property, close to town and the beach. The owner was so helpful and knowledgeable about the area and the plants and animals in the area. Customer Service was excellent, very good location , beautiful pool. My wife and I stayed here on our Honeymoon. We loved the location as it was right next to the beach and walking distanced to the main strip. Our room was very clean and spacious. The front office staff was very friendly and very helpful. They helped us accommodate a very late check-in and provided lots of good recommendations on things to do. Highly recommend. the owners were fantastic, very engaging and went the extra mile to ensure we had a good stay! Great location to beach, restaurant, marina and town! Walking distance! We had a unit with 2 bedrooms, 2 full bathrooms. Both bathrooms were en suite. The location here is very good. Far enough away from the hustle/bustle but still within walking distance (for us) of the shops and restaurants in town. Martin at the front desk was completely wonderful. He helped us book our snorkelling trip and gave us loads of advice. A real pleasure and we were so thankful for his assistance. There is a really big, nice covered terrace in the back of the unit. They have beach chairs available for use, which is a really nice touch. Great spot, within walking distance to everything at a very affordable price. Lovely friendly owner, who even kindly offered to drive us to a restaurant when it was teaming with rain and we were late meeting friends. Fantastic host, so welcoming and helpful. Unit was spacious and well equipped. Pool and BBQ area great. Excellent location, easy walk in to town anabolic right by the beach. 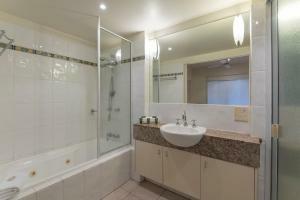 Two bedroom unit was spacious, with each room having an ensuite. Clean, crisp sheets and towels. Kitchen was fully self contained with oven, hot plates, microwave and full size fridge. Large living and dining room space, plus huge terrace with table, chairs and sunlounges. Our host, Martin, was so helpful, recommending places to eat and offering to help with anything to make our stay an enjoyable one. 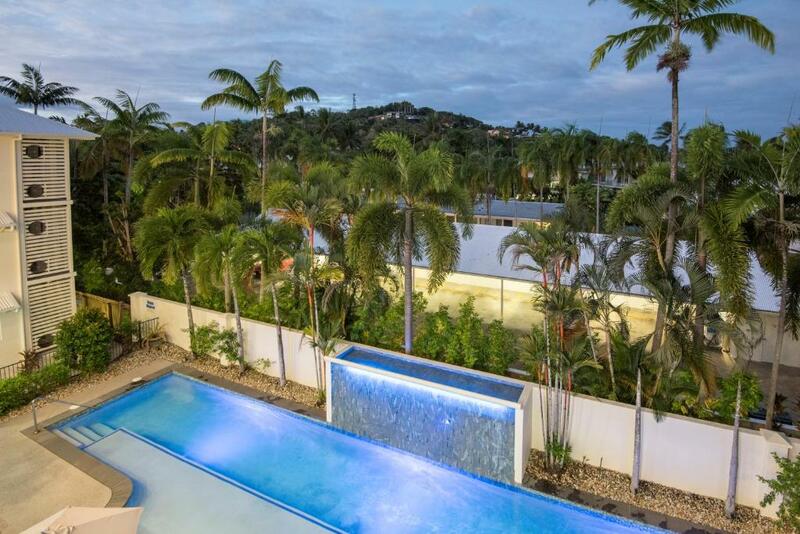 Great pool - able to swim laps or just laze on the shallow ledge. Only 2 minutes from the beach and Martin has a supply of beach chairs and boogie boards that guests may use at no cost. We took advantage of this as the cost of hiring lounges and umbrellas on the beach was exorbitant. Short walk to Macrossan Street, with plenty of options nearby for dining. Thoroughly enjoyed our stay at Mowbray by the Sea. The location of the apartment was great...close to beach and shopping. The apartment facilities were excellent and the lovely swimming pool topped things off. can't say enough good things to say about our hosts Martin and Theresa. So helpful and always positive. Fantastic location, great staff. Martin and Theresa were great and made you feel very welcome. The apartment was very comfortable and we really enjoyed the pool. I would highly recommend staying here. Lock in a great price for Mowbray By The Sea – rated 9.5 by recent guests! 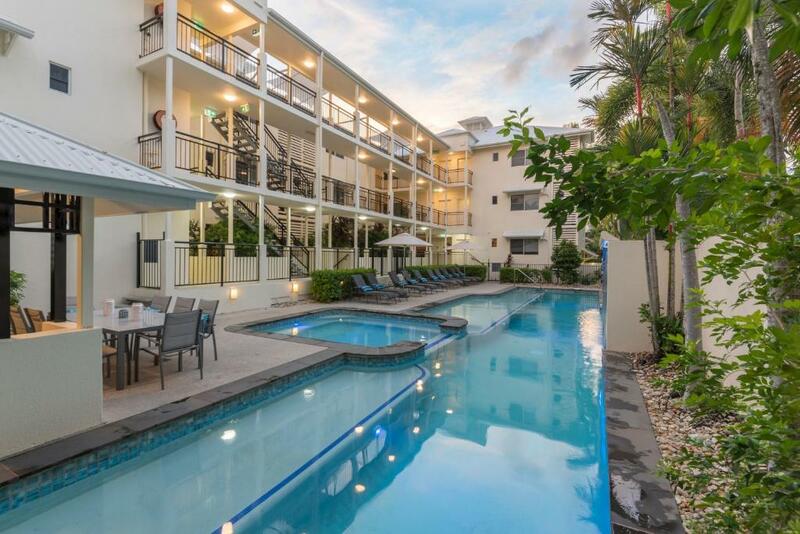 Mowbray By The Sea This rating is a reflection of how the property compares to the industry standard when it comes to price, facilities and services available. It's based on a self-evaluation by the property. Use this rating to help choose your stay! 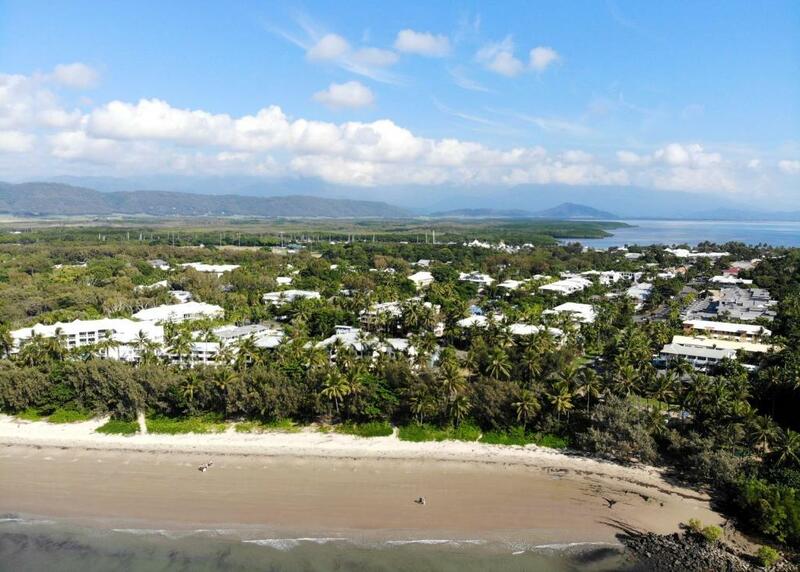 One of our top picks in Port Douglas.Mowbray By The Sea offers sophisticated and spacious self-catering holiday apartments, short walk to the famous Four Mile Beach and about 5 minutes' walk to the main Macrossan Street’s cafes, restaurants and shops. Facilities include a 100 feet heated pool. 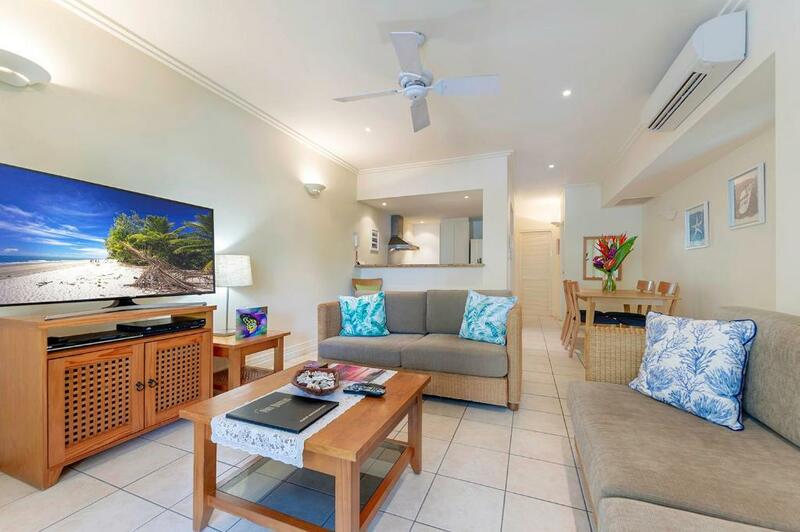 Each air conditioned, 2-bedroom, 2-bathroom apartment includes a private balcony, washing machine and tumble dryer and premium cable TV channels. 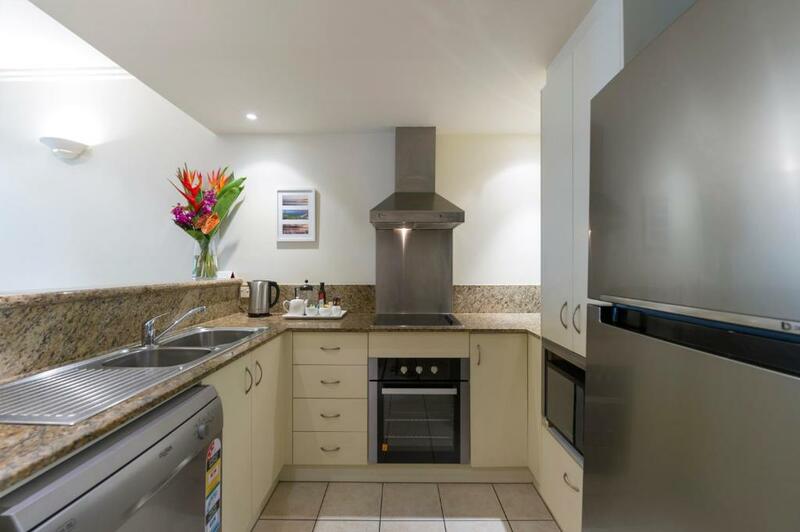 The fully equipped kitchen has a microwave and dishwasher. Most apartments have a spa bath in the 2nd bathroom, subject to availability. Free WiFi is included and all private balconies overlook nearby park lands. The landscaped gardens are home to a barbecue area and outdoor pool. Free secure undercover car park is provided. The tour desk can arrange trips to the world heritage Great Barrier Reef, Daintree Rainforest and Cape Tribulation. When would you like to stay at Mowbray By The Sea? This spacious, 2-bedroom apartment is fitted with 2 bathrooms, laundry and fully equipped kitchen. Most apartments have spa bath/bath in the 2nd bathroom, subject to availability. Mowbray By The Sea is located 100 meters, approximately 2 minute walk to Four Mile Beach and approximately 5 minutes to the main street Macrossan. There are always activities for all ages, from Jungle Surfing, Reef Tours, Crocodile Farm. Kuranda Scenic Tours or simply enjoying many flavors of ice cream as you walk around town. We can help book your tours at no cost. House Rules Mowbray By The Sea takes special requests – add in the next step! Mowbray By The Sea accepts these cards and reserves the right to temporarily hold an amount prior to arrival. Please be advised check in is not available on Christmas Day. Please contact the reception using the contact details found on the booking confirmation for more information. Please inform Mowbray By The Sea of your expected arrival time in advance. You can use the Special Requests box when booking, or contact the property directly using the contact details in your confirmation. Martin & Theresa great hosts. Couldn't do enough for us during our stay. Good recommendations based on Local knowledge also. 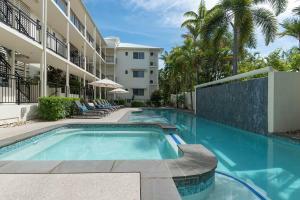 Perfect facilities located between Beach (100metres) & Macrossan St (700 metres). Will definately stay again in the future. Well priced accommodation also. Loved the Pool! Location, staff wrre great and very helpful. Good value for money. Mowbray By The Sea was fantastic in every aspect. The staff were wonderful, the apartments were fantastic, the pool was wonderful, the location was great. The staff were friendly and helpful. The apartments had everything you need. They're perfect for a family. The kitchen allows you to save some money by cooking. The laundry was handy, especially as washing liquid was supplied. The rooms, both with an ensuite, were comfortable. The air con and fans were welcome. We also enjoyed the Foxtel. The balcony was wonderful with lots of room. The pool could easily accommodate many people of different swimming abilities. The location was fantastic with only a short stroll to Four Mile Beach and an easy wander to shops and eateries. After a long flight we were relieved to find that all our research had paid off - amazing apartment with super air conditioning, a very comfy bed, exceptionally clean and friendly owners who quickly became friends. Brilliant location and spot on advice for the tours. Can’t wait to return. Oh and the pool - our 5 year old has now learned to swim ! Can't think of anything negative at all! The apartments are nicely located within a very short walk of a beach. The walk to the centre of town is slightly longer. The beds were comfortable, the kitchen and bathroom well stocked with everything you need. Excellent apartment with two good rooms with attached baths, a good living room and a spacious balcony. Well equipped with all necessary amenities. The property also has a swimming pool and good parking facilities. Very helpful staff ; there was personal touch to the way they offered to help at every juncture. Property located right next to the beach. Basically everything. Very welcoming and helpful management, great location.